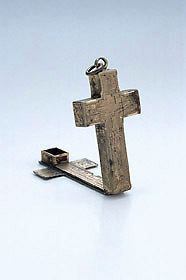 This small example of a crucifix dial has on one side, as was common in such instruments, an illustration of the Crucifixion. On the other, outer side of the cross is engraved an unidentified coat of arms and the motto 'Nil admirari' ('Nothing is to be passionately desired'). The maker, Adriaan Zeelst, also wrote a work on the astrolabe entitled Vtrivsqve astrolabii tam particvlaris qvam vniversalis fabrica et vsvs (Liege, 1602), with Gerardus Stempelius.